10 Comments Published by katitude on Wednesday, January 02, 2008 at 1:33 a.m..
Ok, the holidays are thankfully past us once more, and it's time to cast my eyes upon the next thing: Eh-Vegas. The date has been set for the weekend of February 23/24, and I've got a few options that I'd like to bounce off y'all that are planning on joining the Northern version of WPBT degeneracy. readily available cash games, slots, craps, etc. I'm sure there are other pros and cons, but it's late and my brain is a tad fried. Please let me know 1) if you're hoping/planning/thinking on coming and b) which option sounds best. Comment here or email to badkatitude at gmail dot com. I can't guarantee what you want will happen, but I'll do the best I can to accommodate the majority (within reason *grin). However it works out, you know Peb's and I are there. No Juice = more Scotch but no alt. degenerate gambling. Niagara = IG and hopefully Rooster. Plus all that luscious alt. degenerate gambling. Club = No alt. degenerate gambling, but possible great meal prepared by Astin. I'm in for any of the options. Niagara might be most appealing for the out-of-towners. But would they be willing to host a tourney? # Butch Howard 3:04 p.m.
Aww, maaannn. Mary and would love to travel north for a poker gig, but that weekend won't work for us. Mary remembered that she does not have a passport yet (silly borders) and is not likely to wrap up the red tape in time. Nelson also has cheer competitions on either side of that week that crunch us a bit and it is a bit far from our May anniversary to be credible in the claim for that trip. However, as May draws closer we are thinking that a 26th year visit to that traditional place but really for some poker with internet buddies might be a nice plan. 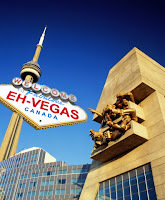 Have fun at Eh-Vegas and maybe we will see you in May. # Mr. Bankwell 4:36 p.m. I think a home game would be best. The casino might be hard to get all of us at one table plus the rake can be pretty brutal and we would all be losers at the end of the night because of that. That is why I'd say home game. Rake Free as a friend of mine says. Well, I can't weigh in on options that much, as I'm not totally sure I can be in, but I'm seriously considering this. Toronto / Niagra is totally driving distance from Pittsburgh, and poker is great and all. # The Wife 7:22 a.m.
Would love to come North - but do you have to have it during the middle of my busiest time of the year? Maybe next time . . . when the hubby is home. If I'm cooking for all the degenrates coming, I think I'll need more chairs. I have to go with Tart and ask if either casino will even host a tourney, especially on a weekend. I think for the game, the club is the best option. We know they're good, and they have the space and ability. Plus, the club allows for pre/post drinking/eating/playing at my place if need be, since I'm down the road. Although a 5-10 minute walk seems twice as long in February. Niagara is good if we want to play cash and have alt. gambling. Craps anyone? My vote goes to a Home game. But no matter what, SuzyQ and I are in. sigh...would love to be there except for the 30 hour flight and the minus whatever degree temperature in February. But last year was such a laugh I'd brave both of those to be with you! My preference would be Casino Niagara. The rake is not really bad, Alt gambling, etc. And since I'm there 3 times a week, I'm fairly certain I can get them to host a private tourney. One thing to also keep in mind is for anyone flying or driving in from the states, starting on Jan 31st, the border crossing gets harder with the new laws. Make sure you have not only a valid drivers license, but real proof of citizenship such as a passport. Having it at Niagara would make things a bit easier for those that might have issues crossing the border because of this. But if it is in TO, I'd be more than happy to offer rides to anyone wishing to fly into Buffalo-Niagara Airport to avoid flying on an international flight and dealing with all that.